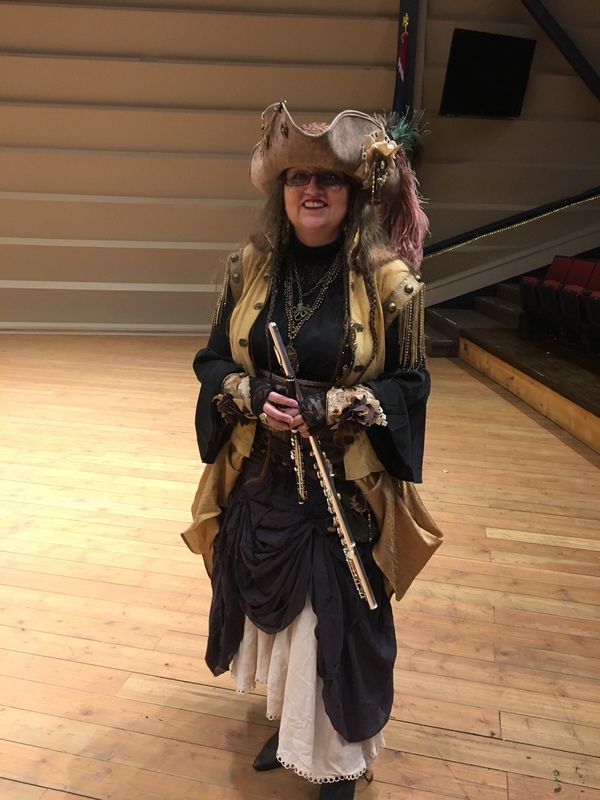 Every year the Jackson Hole Community band performs a Halloween Concert and the whole band wears a Halloween costume. The concert is for the children but adults enjoy it as well. 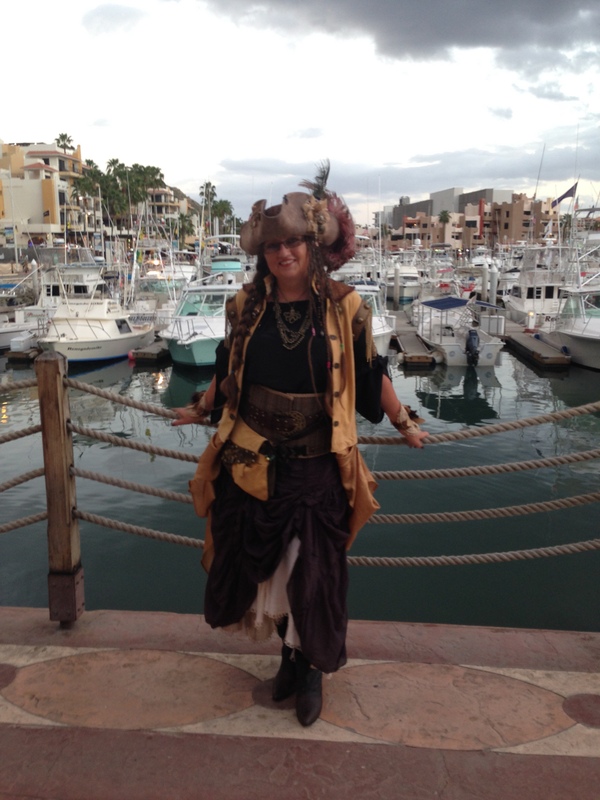 In 2014 I decided to be a pirate. 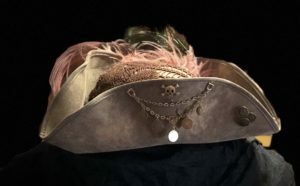 When I started planning my pirate costume, [future post], I knew I wanted a unique pirate hat to bring it together. 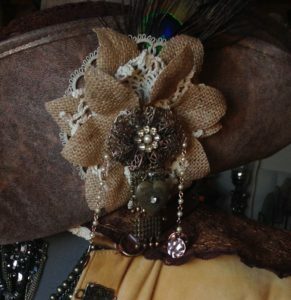 I browsed Pintrest for ideas, adding the word “steampunk” to the search terms to find that swashbuckling look I wanted. 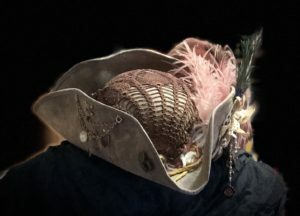 Once I had an idea in my brain of what I wanted my hat to look like, I dug through my craft supplies, and shopped dollar stores, craft stores, and yard sales for unique bobbles and scraps that would work in my color scheme. 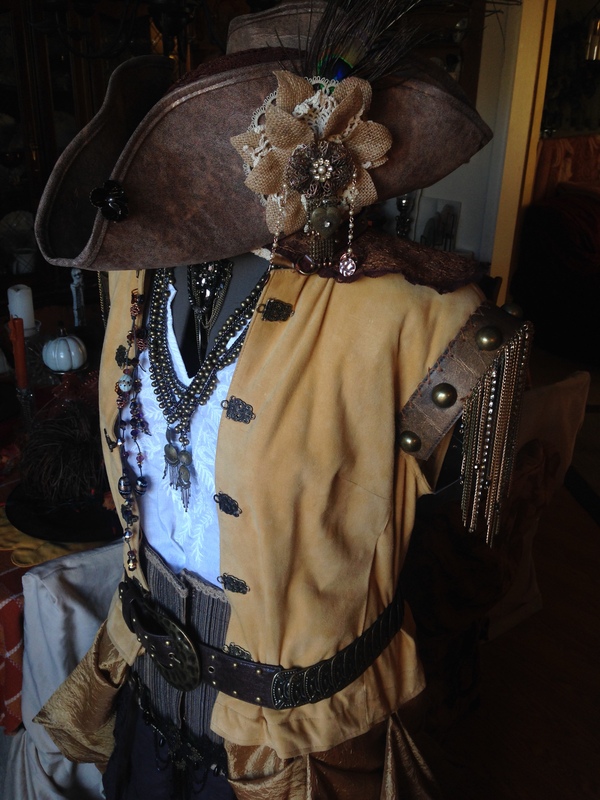 I needed a plain pirate hat that would fit my head and I could glue and hand sew things onto. 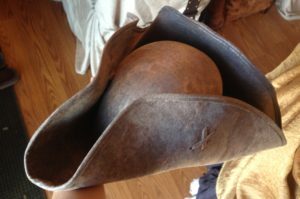 I found this hat on Amazon.com, I would not recommend this hat for someone with a small hat size, but it worked perfectly on my medium to large hat size head and it is very comfortable. The price is well worth it. 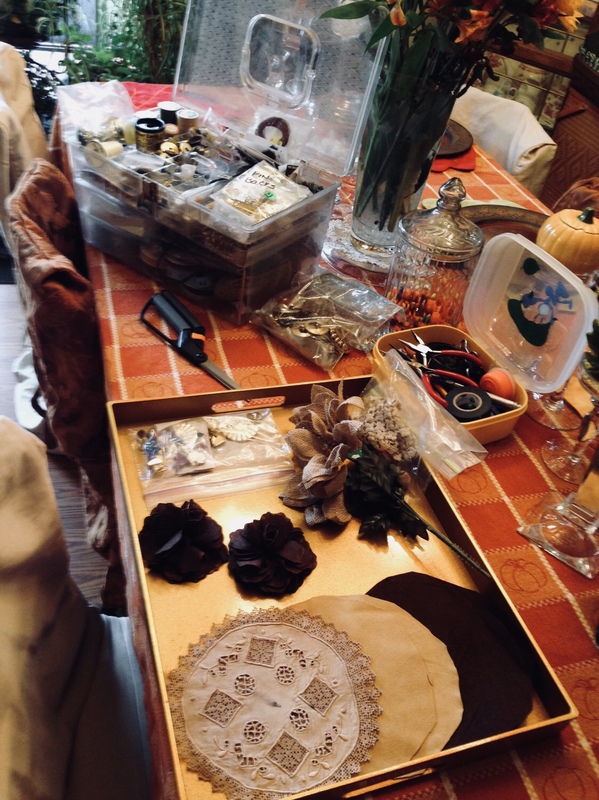 I gathered my supplies and spread them out to see my palette and went to work. Junk and broken jewelry and some perfectly good pieces from the 80’s. 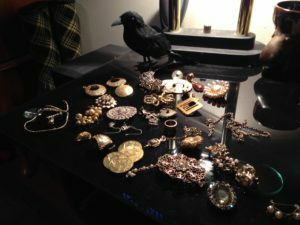 Funny how the jewelry I wore in the 80’s is now appropriate for a Halloween costume! Sewing box, buttons, tools, craft flowers, doilies, and some fabric scraps to get me started. The first thing I wanted to do to the plain hat was dress up the smooth top into something more feminine. 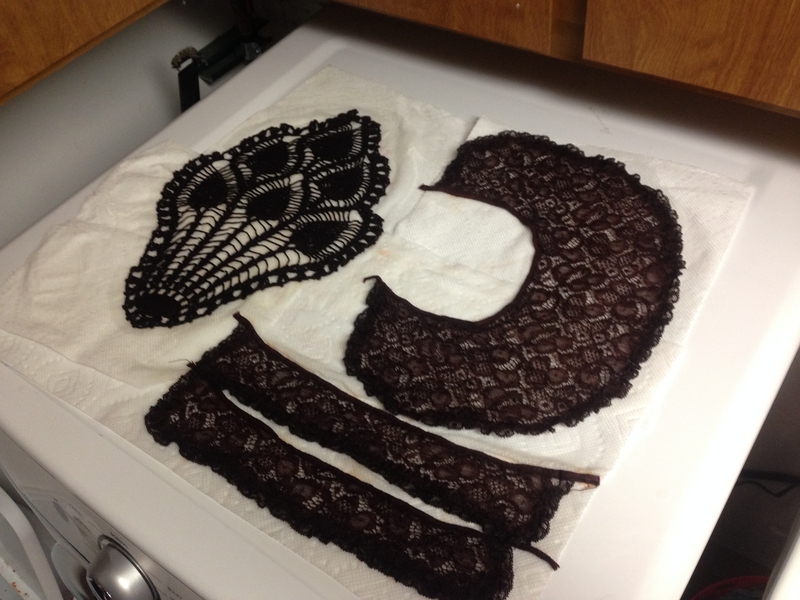 I had a few lace and crocheted scraps I picked up at garage sales. I dyed them brown to use in various places on the pirate costume, [future post]. 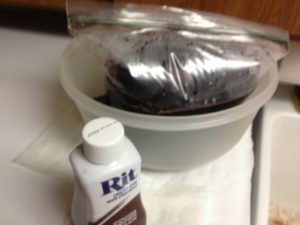 Learning from the mess I made dying some things black for my Gray Lady Costume, I used the liquid, not the powdered Rit dye. 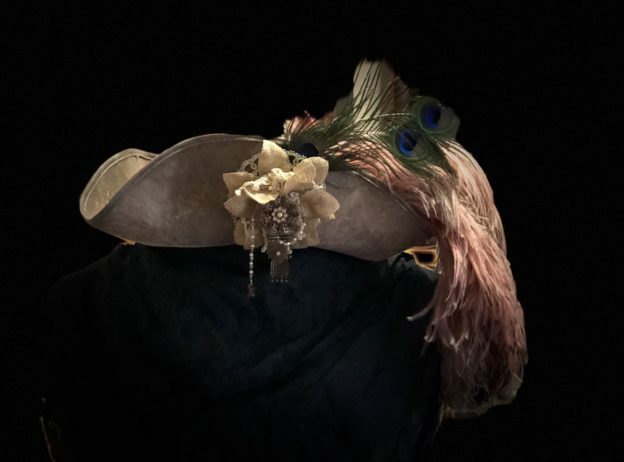 I used the crochet scrap with the peacock design and some Tacky Glue to glue the doily to the top of the hat and let it dry completely before doing anything else. I dry brushed the scrap with some gold craft acrylic paint to give it some depth and sewed some old looking buttons to the front to give it a finished look. For a really great costume remember to add detail as many places as possible. With this in mind, I added bobbles to all three sides of the brim. 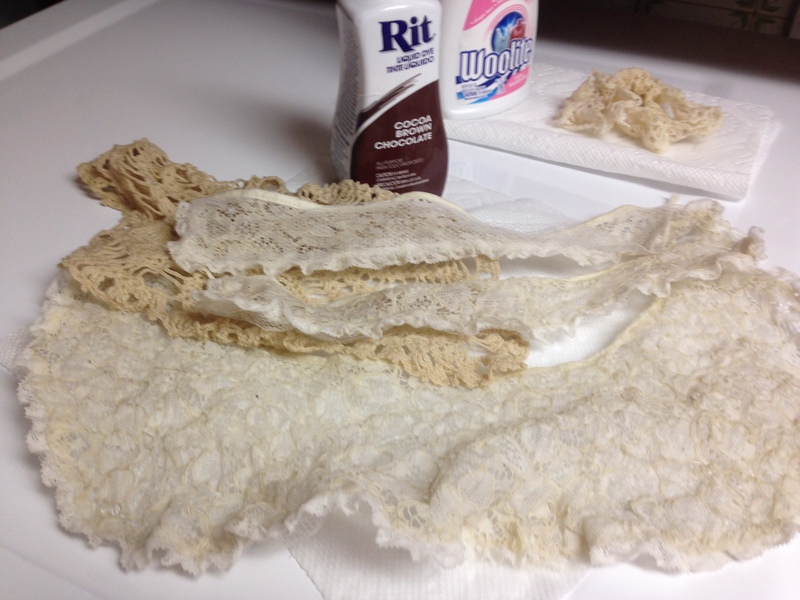 On the left brim I stacked some doilies with parts of a burlap flower I took apart. I added an old broken broach to the center and used my jewelry tools to add some dangles. When I sewed it all together I added a couple peacock feathers behind the flowers. Later I added some felt to the back of the dangles because it was making sounds while I was playing my flute. On the right brim I sewed on an old broken bracelet with coins, added a trio of buttons near the front, and a skull and cross bone button above the bracelet. 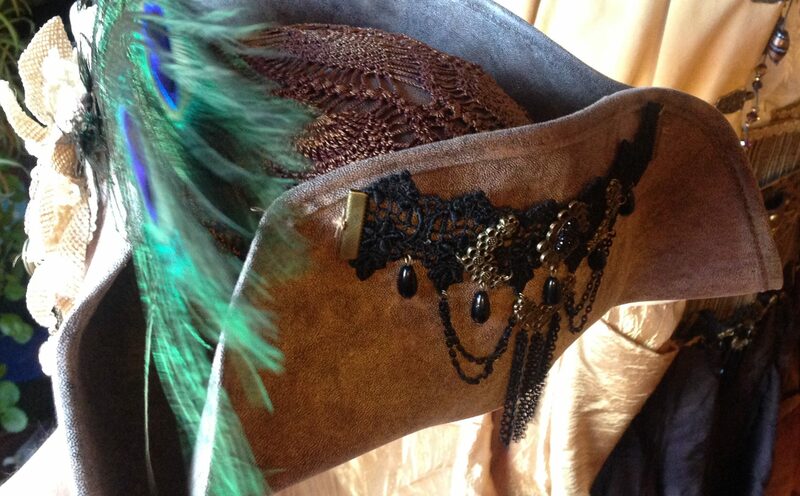 Fot the back brim I used a fancy Gothic black lace choker i had purchased for another costume but didn’t use. I used a needle and thread to tack the ends down, allowing it some movement. 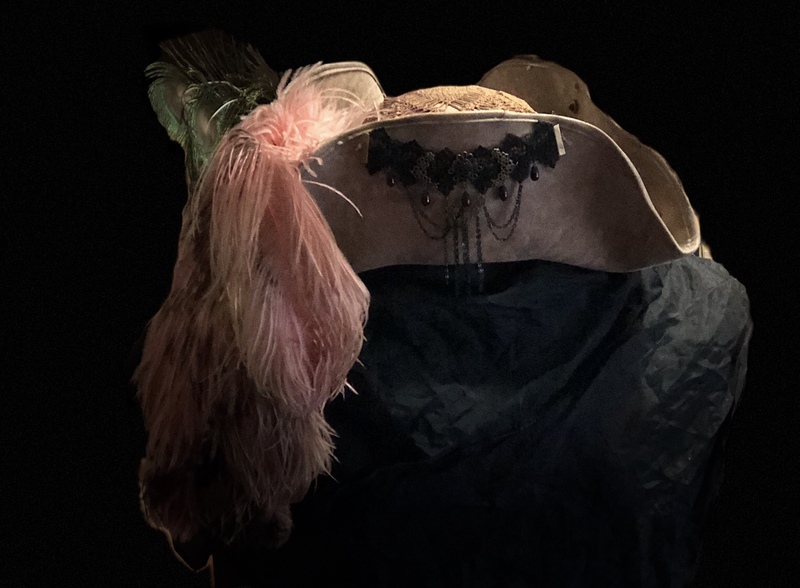 To finish it up I added a big set of pink ostrich plumes behind the brim, by the peacock feathers, and secured it by sewing it on with a heavy duty needle and thread, (a thimble on my thumb and finger was a life finger saver for this project). 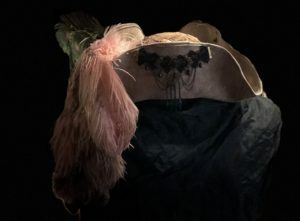 The bottom of the set of plumes is tied with a leather strip so if seen it looks finished, and the plumes stay in place. I found the plume at a garage sale back the 80’s and had used it on a couple other costumes and for decoration over the years. 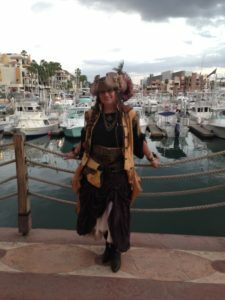 In 2015 I brought the pirate costume, [future post], with me on a trip to to Cabo San Lucas, we planned to attend a Halloween event on the marina. I had to wear the hat on the plane because it would not pack, it made for an interesting flight. 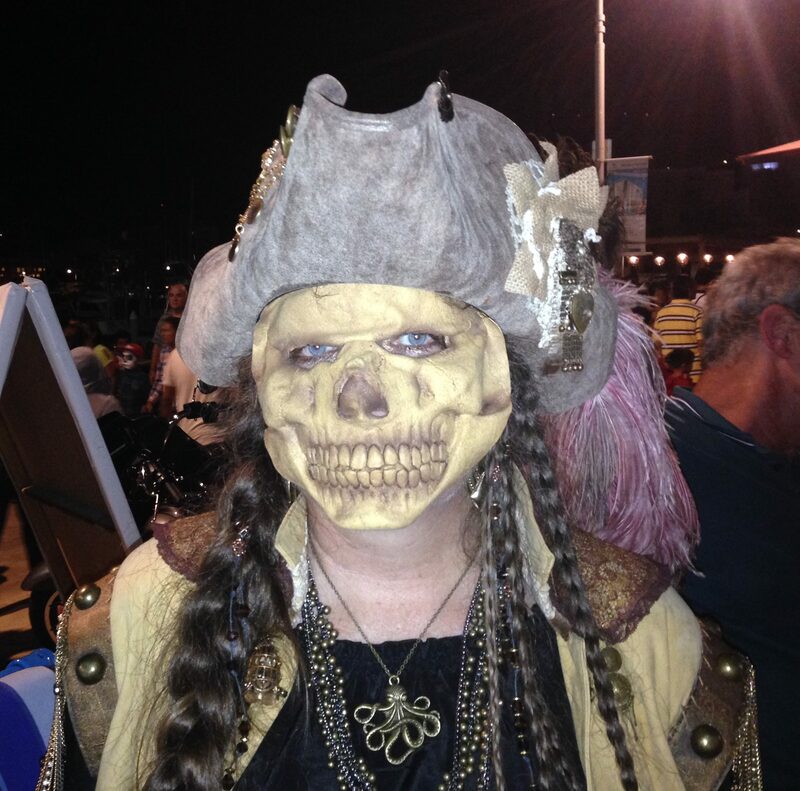 While there I was given this mask that gave the costume a less kid friendly look. And when I returned… I was wearing the hat when customs took my photo. I took the photos with the black background with my new iPhone 8. This entry was posted in Crafts and tagged costume, Crafts, DYI, Halloween, Pirate Hat, Steampunk on March 29, 2018 by TetonTrekker. 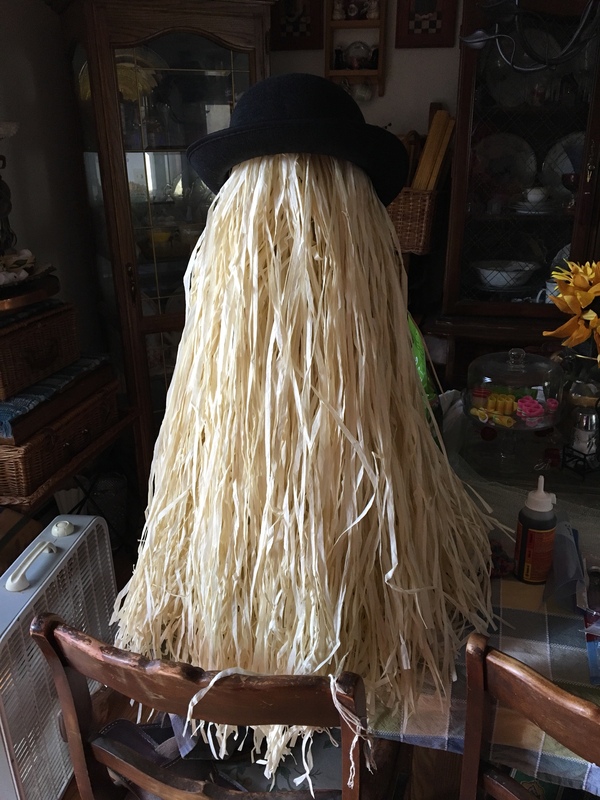 I had to keep Cousin it locked away in a closet for Halloween until he made an appearance with the Jackson Hole Community Band at their annual Concert for the Kids. 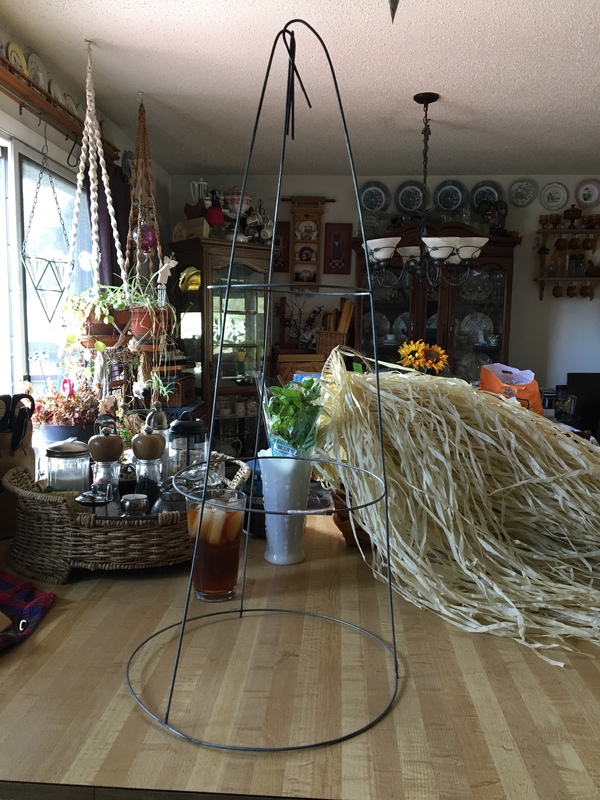 Tun the tomato cage upside down and bend down the stakes. Wrap the cage in plastic wrap. Wrap the hula skirts around the cage. If the cage is taller than the skirt is long start low and use wire ties to hold in place. Use enough skirts to cover with a full head of ‘hair’. They are only a buck, don’t be stingy. 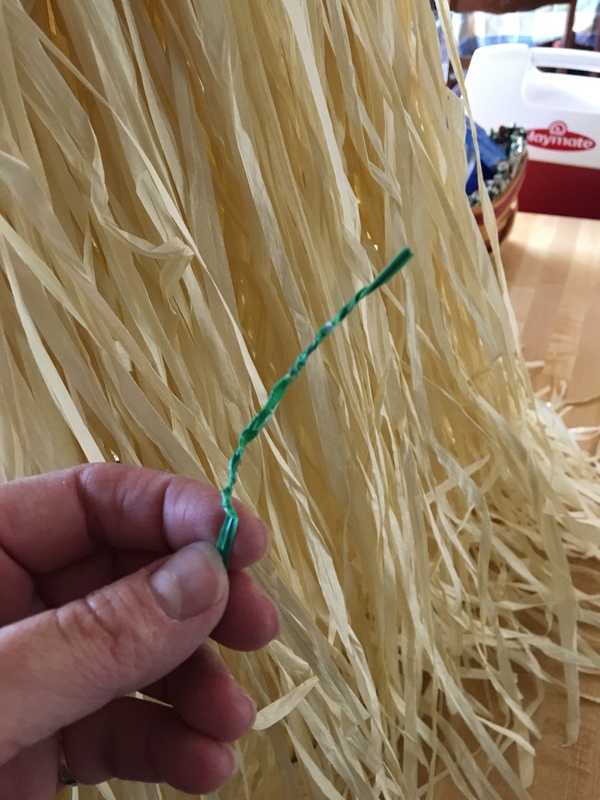 Use wire tie to secure ends to top. Place glasses appropriately, it can be stuck through the plastic wrap or taped to it. Keep the cuz out of your cat’s reach. 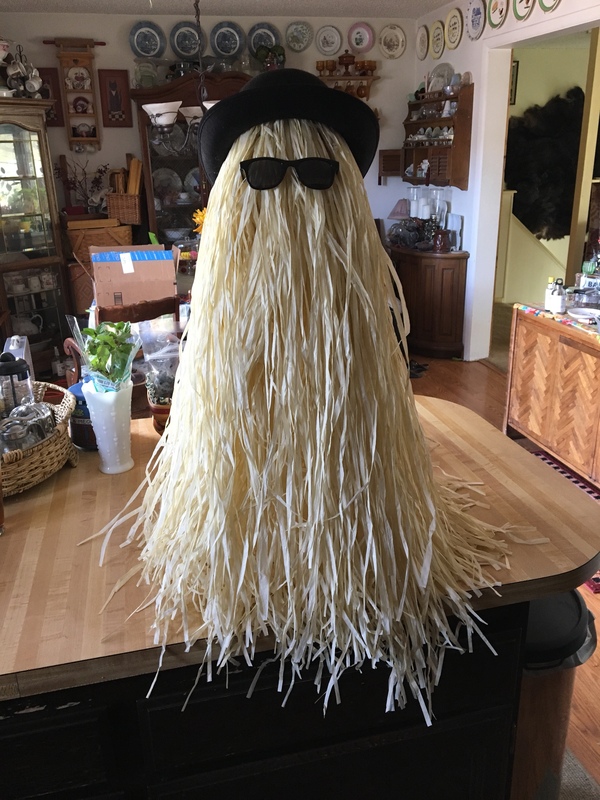 I proudly put my new decoration on the kitchen table and went to get my camera, I came back to a hula mess on the kitchen floor. 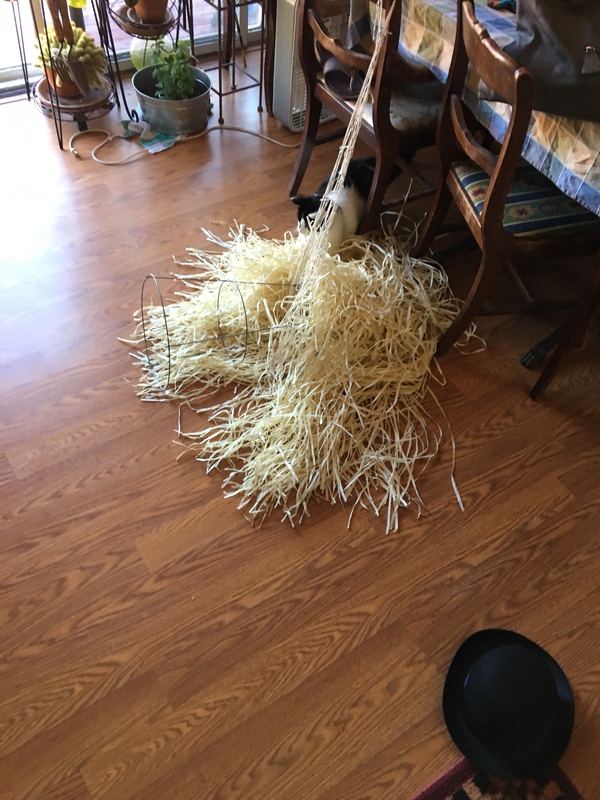 Herbie could not resist for a minute, he had cousin it on the floor in pieces and was still torturing his prey. 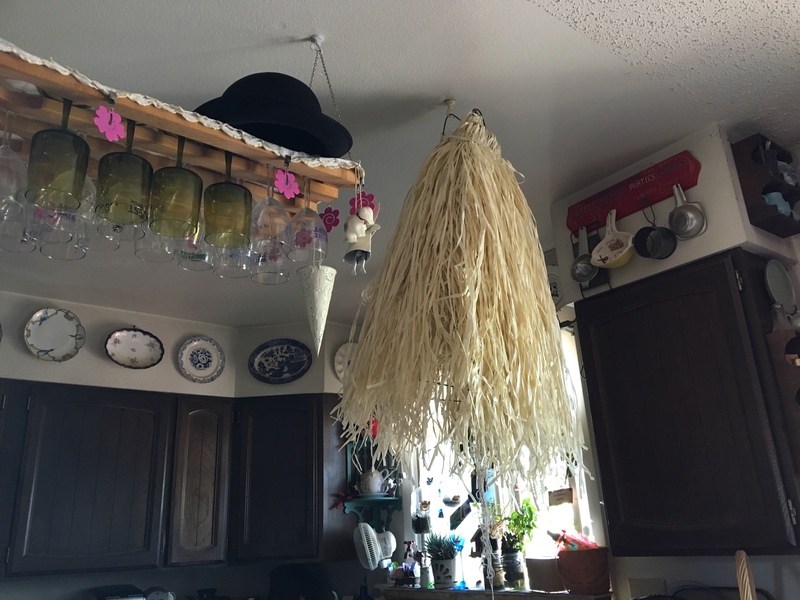 Hanging from a ceiling hook did the trick. 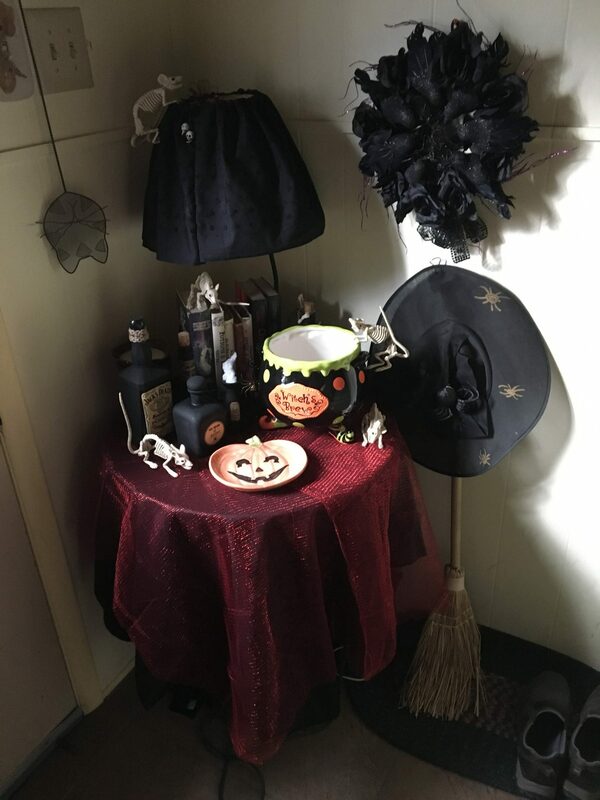 This entry was posted in Crafts, Crazy Critters, Herbie and tagged Crafts, Crazy Critters, Halloween, Halloween Decorations, Holly Balogh, JHCB, music on January 1, 2018 by TetonTrekker. 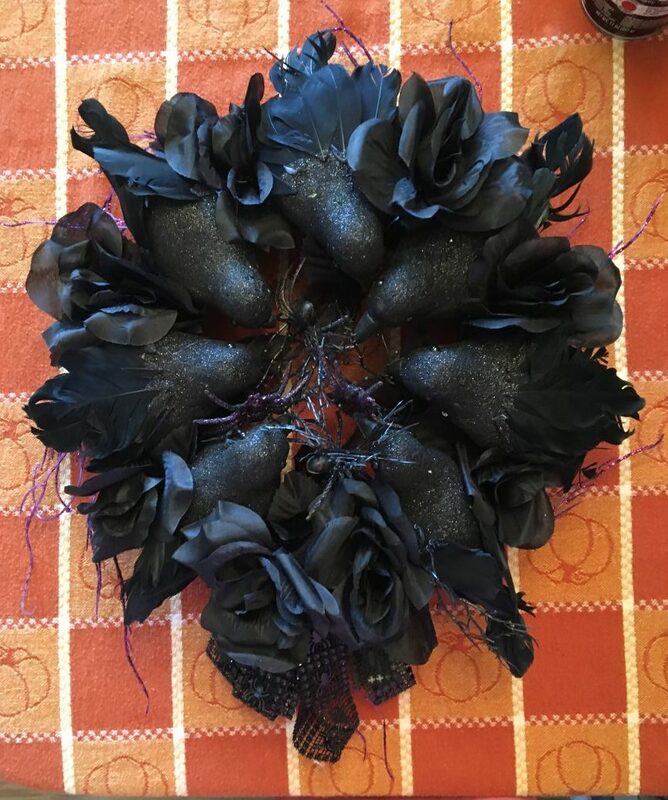 How to make this Halloween wreath from things found at the Dollar Store. Wrap the ring with black tape if the ribbon does not cover the color of the ring, then wrap some wide ribbon and pin it in place. 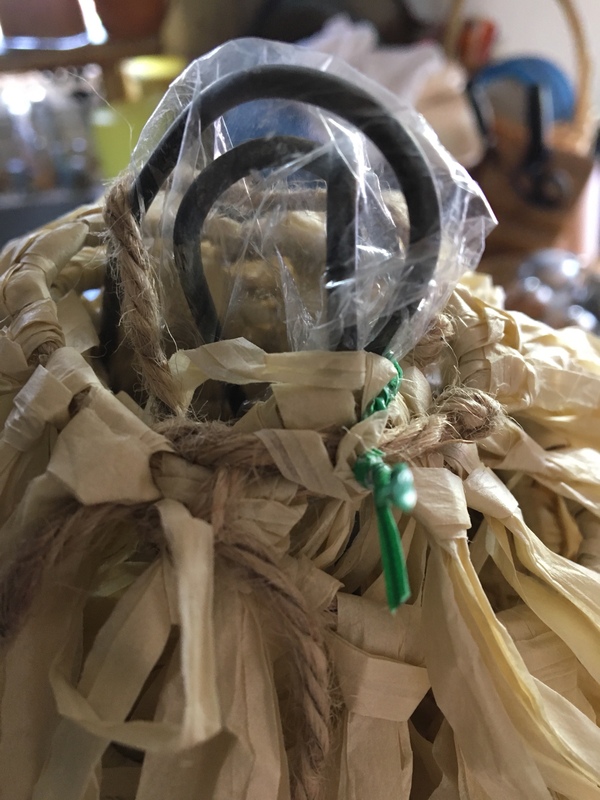 Use the wire that is on the bottom of the crows’ feet and press them into the ring somewhat evenly spaced.If the crow did not have wires in the feet, use the pipe cleaners. Arrange a bow with the thinner ribbon and pin it to what will be the bottom of the wreath. Wrap a pipe cleaner as a hanger on the opposite end of the Wreath. Clip and trim the flowers from the bunch leaving enough stem to press into the rings without poking out the other side. Fill in spaces with the flowers. Clip apart the floral accent and poke the ends around the outside of the wreath for accent. Please return and reply with a note about your wreath and any variations you did. This entry was posted in Crafts and tagged Crafts, crows feet, Dollar Store, Flock of Crows, Flock of Ravens, Halloween, Halloween Decorations, Murder, Wreath on October 22, 2017 by TetonTrekker.